Marguerite Holloway has written about science—including natural history, environmental issues, public health, physics, neuroscience and women in science—for publications including the New York Times, Discover, Natural History, Wired and Scientific American, where she was a long-time writer and editor. She is the author of The Measure of Manhattan, the story of John Randel Jr., the surveyor and inventor who laid the grid plan on New York City, and of the researchers who use his data today (W.W. Norton, 2013); she recently wrote the new introduction to Manhattan in Maps (Dover, 2014). Holloway is currently working on several innovative digital projects. 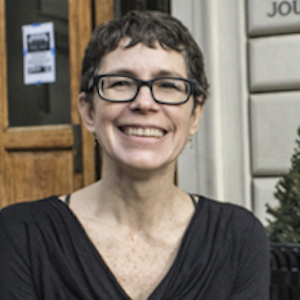 She and colleagues at Columbia and Stanford universities have a Magic Grant from the Brown Institute for Media Innovation to develop Science Surveyor, an algorithmic tool to improve science journalism. And Holloway and colleagues from Fordham and Brown universities are working on The Templeton Project, a sensor-based effort to chronicle the story of New York City’s rats, which is funded by the Tow Center for Digital Media. Holloway has a B.A. in comparative literature from Brown University and an M.S. from the journalism school. She won the Distinguished Teacher of the Year award in 2001 and a Presidential Teaching Award in 2009; the New York Observer named her one of the city’s top professors in 2014.